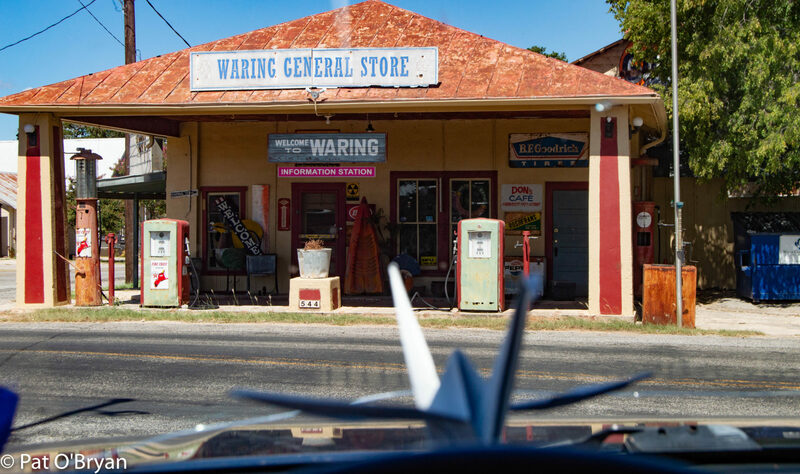 Funding the Terlingua Food Bank. There are hungry children, disabled people, and neighbors down on their luck right here in Terlingua. To most of us, they’re invisible. If you can’t attend the benefit, you can download a PDF of the pledge form, print it out, and send it in to the Family Crisis Center. That would be a good thing to do. At a recent meeting of the Big Bend Citizens Alliance (BBCA), the local non-profit that is the umbrella organization for my TerlinguaCares non-profit, I had a fascinating conversation with Mike Drinkard, who runs the food bank here in Terlingua. 1) by ordering food from the area food bank “menu,” Mike can get food for the local food bank very cheaply. He can keep the 600 or so people who need assistance from starving for just $400 a month. 2. Some months, he can only serve a few people because he can’t come up with $400/month. I had no idea. Did you? I have friends who live in shipping containers. I have a couple of friends who live in tents. But, they do so because they want to. When I hang out on the porch or bop around town, I don’t see anybody who looks homeless or hungry- well, that’s not entirely true. Terlingua fashion does tend to be a little informal. But, I didn’t know anybody was missing meals- especially children! Surprise! There are over 600 people in our neighborhood who need food assistance. Over half of them are children or disabled adults. We can’t rely on the government to fix this. This is my problem. This is your problem. No way are we going to allow children to go hungry in Terlingua. We’re going to fund the food bank. We’re looking for heroes to permanently fund the food bank by making regular, monthly donations. We’ve found our first two heroes: Ruffin Moore, the General Manager of Lajitas Golf Resort, has agreed to donate $250 a month. Mike Davidson, Alpine City Councilman and Pinche Gringo has agreed to donate $25/month. (update) We have two new heroes! Glen at La Kiva has pledged $420 a month- and is challenging other local businesses other local businesses to pledge what they can to improve quality and quantity. Mike Perry of the Alpine Daily Planet has pledged $25/month. To volunteer to be a hero, contact Mike Drinkard at 432-371-3147. Your contributions are tax-deductible and all proceeds will go to buy food for hungry people. We’re also going to hold a benefit concert at the Starlight Theatre on March 2nd, Texas Independence day. We need musicians to play and items to donate. We also need you to be there! To volunteer to play or donate an item for the auction contact me (Pat O’Bryan) at koanwrangler@gmail.com. 1) if the choice is between not eating and eating empty calories and transfats, let’s go for the empty calories. We need to make sure the food bank has at least $400 a month that Mike can count on. 2) we don’t want our neighbors eating that stuff – it makes you dumb and kills you. The ultimate goal is to provide healthy, nutritious food (beans and brown rice would be a big step up) for our neighbors who need help. We need to fund the food bank sufficiently so that Mike can order and distribute nutritious food. Local musicians hold a hootenanny at Marfa Public Radio for Pete Seeger. It was a last-minute call that went out through Jalapeño Schwartz’s Facebook page – local musicians gather at Marfa Public Radio station tonight at 6:30 for an on-air tribute to Pete Seeger. J.P. “Jalapeño” Schwartz, also known as “Doc Cactus,” (although, really, shouldn’t it be Dr. Pepper?) hosts the blues show, play harmonica and keyboards in local bands, and is a country doctor. Trevor Reichmann was there, virtually. He recorded “We Shall Overcome” in his home/dome studio and sent it through the inter-webs to the radio station. Only a few musicians braved the sub-freezing temperature – Maria Moss, Doc, Beth, and me. J.P. printed out the lyrics for a few Pete Seeger songs and we quickly rehearsed in the lobby. It was a ragged, soulful sing-along… I do hope the people listening at home joined in. 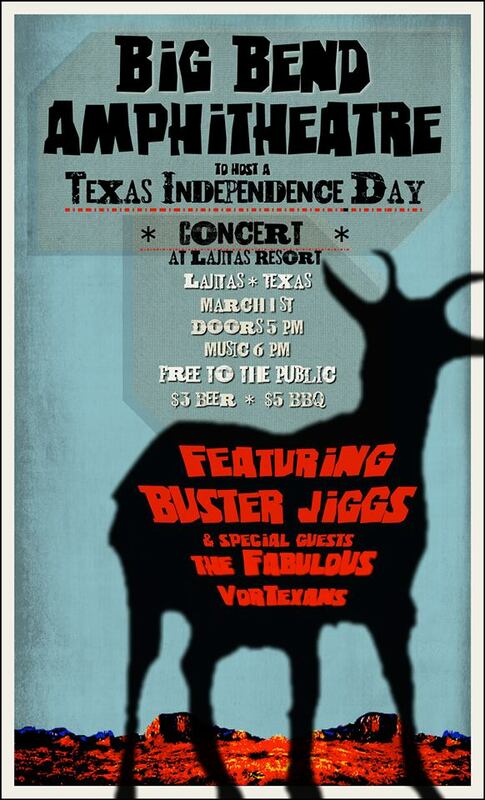 Buster Jiggs and the Fabulous Vortexans at Lajitas – Free Show! Free Outdoor Concert in Lajitas! March 1st… Cheap beer and BBQ. Beautiful outdoor Amphitheatre. Did I mention that it’s a FREE show? The Vortexans will go on around 6 PM. Buster Jiggs will follow. If you haven’t seen them before, check out the video below. They’re real good. And… you know the Fabulous Vortexans. Come out early to support the home team! Chili Cook-off at the High Sierra – Terlingua, Texas. There is a chili – salsa – beans – and music party at the High Sierra in Terlingua, Texas. The High Sierra’s Annual Chili CookOff is on for Jan 24, 25 & 26! We will be open for breakfast at 8 am for those three days. Musicians, come jam to a crowd of 200 or more at our outside bar! The Concert for Noemi – Starlight Theatre Sunday, 1/5/14. The Terlingua community rallied for Noemi. It was a night of celebration, dancing, auctioneering, music and love – and Teringua raised over $2,000 for Noemi and her family. Mike Davidson was our Master of Ceremonies. He pointed out that the U.S. border policies amount to an ethnic cleansing program. I think he’s right- you don’t see the same tactics used against Mexicans on the Southern border used against Canadians on the Northern border. Those policies – especially as implemented since the border closings following 9/11 – have had the (hopefully) unintended consequences of tearing families apart and creating a criminal class out of formerly good citizens. This was brought home to us in a very personal way as we watched the tragedy of Noemi’s family threatened with massive legal fees and the possibility of having to leave Terlingua and move to Mexico. It may be the law, but it is not right. So, the community gathered. Musicians (Los Pinche Gringos, Collie Ryan, Jeff Haislip, Alex Whitmore, Laird Considine, Charlotte Teer-mumbledehum, Chase Peeler, Jon Hogan, Maria Moss, and others) donated their talents and songs). Auction items (paintings, photographs, cakes, tequila servings, a kiss, gift certificates for massages and hotel rooms, and more) were given and auctioned off. The Starlight Theatre let us have the benefit concert in their gorgeous facility and at the end of the night Lisa Ivey made a significant contribution. Noemi was there with her children, and they danced and celebrated with us. The concert was produced by TerlinguaCares, a 501 c 3 non-profit organization based in Terlingua. After all the money has been received and accounted for, TerlinguaCares will disburse 100% of all the money raised to Noemi. Once again, I am proud to be part of a community with a big heart that takes care of its own. Thank you, Terlingua.